I've had an interest in the exploration of space since I was very young. I noticed that there were two frequencies 259.7 and 296.8 marked next to one of the switches on the communication sub panel. At the time I had an AOR2001 scanning receiver, to which I had added a squelch interface so that I could automatically record any received signals onto cassette tape. So with nothing to lose I setup the AOR to scan between four pre-set channels 259.7 and 296.8 with both AM and NBFM (as I didn't know which mode was likely to be used). After a few days I got lucky and recorded a short burst of a voice with an American accent. I didn't know which of the two frequencies I received it on, but from the background noise I could tell that the modulation was definitely AM. As I thought that I may have been one of the first listeners in the UK to have heard transmissions from the shuttle directly. I wrote to NASA with a transcript of the conversation and asked if it was likely that I had indeed heard the Shuttle as it passed overhead. I decided to install the AOR in my car so that I could monitor the Shuttle when it was passing over when I was driving to and from work. This was very successful, and I heard strong signals on many occasions when Shuttle flights were in progress. By this stage my work colleagues were teasing me about hearing voices, but about a month later I received a fantastic letter back from NASA, which put an end to their speculation. The letter included a personal note from the Mission commander who answered some of my technical questions, signed photo of the STS 51-B crew and also a huge aeronautical wall chart showing the orbits that the mission had taken and the location of the NASA ground tracking and communication facilities. 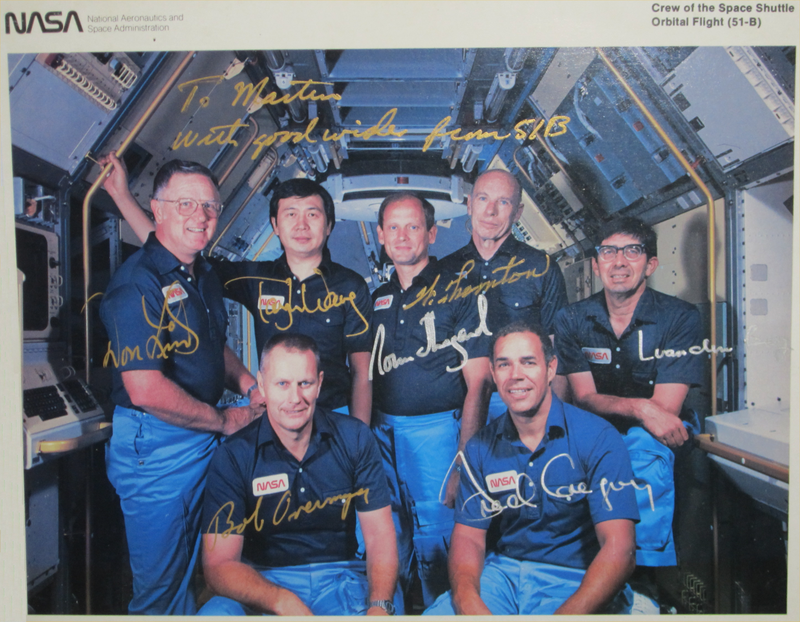 The seven members of the Space Shuttle 51-B flight are: (Standing left to right) Mission Specialist Don Lind, Payload Specialist Taylor Wang, Mission Specialists Norman Thagard and William Thornton and Payload Specialist Lodewijk van den Berg: (seated, left to right) Commander Robert Overmyer and Pilot Fredrick Gregory. 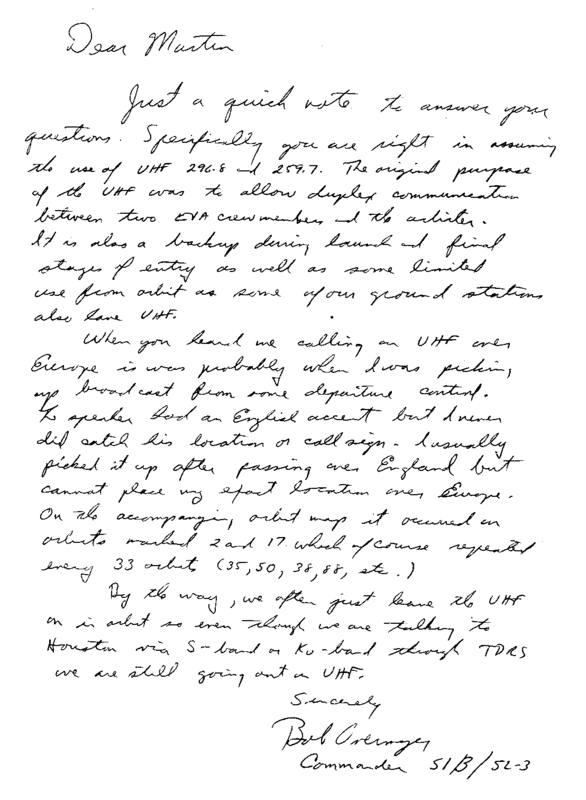 The letter from the Commander Robert Overmyer (who unfortunately died in a plane crash on March 22, 1996) is shown below. Just a quick note to answer your questions. Specifically you are right in assuming the use of 296.8 and 259.7. The original purpose of the UHF was to allow duplex communication between two EVA crew members and the orbiter. It is also a backup during launch and final stages of entry as well as some limited use from orbit as some of our ground stations also have UHF. When you heard me calling on UHF over Europe it was probably when I was picking up broadcast from some departure control. The speaker had an English accent but I never did catch his location or callsign. I usually picked it up after passing over England but cannot place any exact location over Europe. By the way, we often just leave the UHF on in orbit so even though we are talking to Huston via S-Band or Ku-Band through TDRS we are still going out on UHF. 121.2750 Russian EVA Orlan-M Space Suit Voice "Korona-M" FM signal bandwidth of 27 KHz TX (Duplex) RX on 130.1670 MHz Also Soyuz Voice via ZUP-Moscow "Rassvet-M" Progress: manual remote control system "TORU"